We’re already inching through November, kids are off of school 3 days this week and another 3 days week after next (they were also off last Friday). We’re fully into “No School November” an official term here in Portland! Don’t get me wrong, I love my kids but since all 3 have been at school full-time, I’ve kind of learned to love my time away from them (does that make me a bad mom??). Anywho, we spent today at home, I did some cooking and baking and also managed to make some playdough (you can find the recipe on my Instagram). There was also the ridiculously long Uno game, no lie…never-ending. But I wanted to be sure to spend time with them, even though I have about 6 million things to do (and the list keeps growing). They are growing up so fast and every day I see changes in each of them. So here I am at 10:45pm after finally cleaning up the kitchen from dinner, changed sheets and kiddos all in bed. This cake. What can I say about this cake besides, it’s a SPECTACULAR. It’s simple to put together, fail-proof, sweet enough for dessert but also perfectly perfect for morning coffee. I remember my mom making this cake when we were growing up, she called it the 1, 2, 3, 4 cake, something about the number of each item (I still don’t get it) but she always made it and it always made the house smell amazing. Sometimes it was made with apples in the center (as I’m writing it today) and other times with walnuts. With Thanksgiving less than 2 weeks away I want to give you some dessert inspiration. 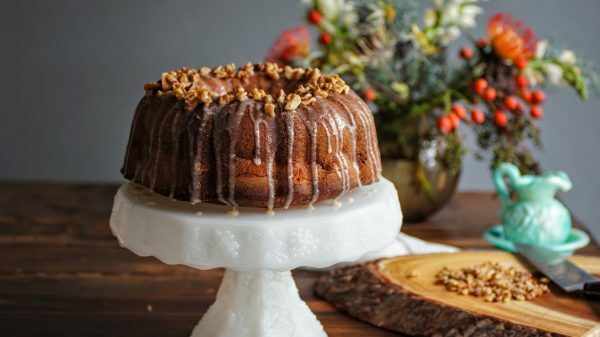 I mean, Thanksgiving is officially the PIE holiday but if pie isn’t your thing or you aren’t ready to make and roll out pie dough, this cake will be the perfect addition to your holiday gathering. I’ve jazzed up the original recipe to include: apples + cinnamon + brown butter + walnuts = all the things we crave on epic Thanksgiving or Friendsgiving holidays. Brown butter, besides cheese and bread this may be my other secret love child. I mean, butter on its own is pretty dynamite but take that butter, melt it down and get all those little brown bits and you have something even more superior. 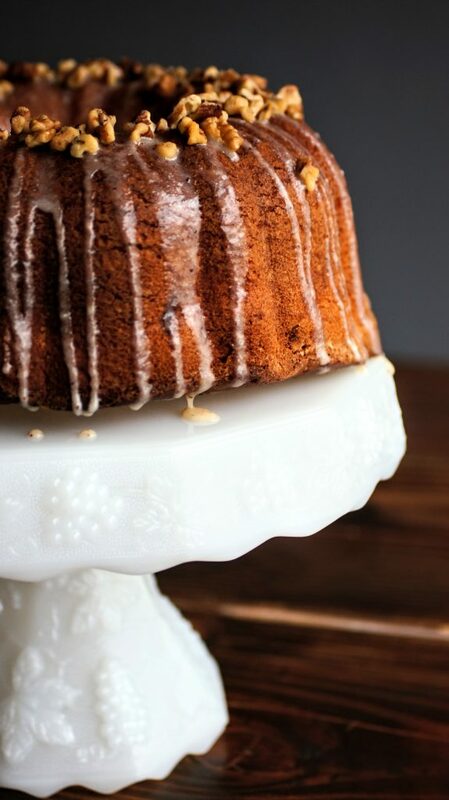 So I thought, hey, why not drizzle this amazing cake with a brown butter glaze, it can certainly do no wrong. So I baked the epic, classic cake, drizzled it with brown butter glaze and topped it with walnuts. I truly believe most desserts should have nuts, don’t you? I won’t digress or lead you on an even longer journey of my ramblings. You can find the recipe for this delicious cake below. Whether you decide to make it for Thanksgiving, Friendsgiving or just a Sunday morning, I promise you won’t be disappointed. As always, I love seeing your creations, be sure to tag me on Instagram @CosettesKitchen or post on my Facebook Page. Preheat oven to 350 degrees Fahrenheit. Butter + flour a bundt pan. In stand mixer, mix eggs, vanilla (or whiskey), lemon zest and sugar until blended and smooth. Add flour, baking powder + salt on low speed. Finally add the oil and orange juice. Blend until smooth, be sure to scrape down sides and bottom. Batter will be thick. Pour half the batter into the bundt pan. Next, mix the apples and cinnamon together in a small bowl and place on top of the batter poured into bundt. Finally, pour the 2nd half of the batter on top. Bake for 65-75 minutes, until a cake tester comes out clean. Remove when done, let cool and remove from bundt pan. 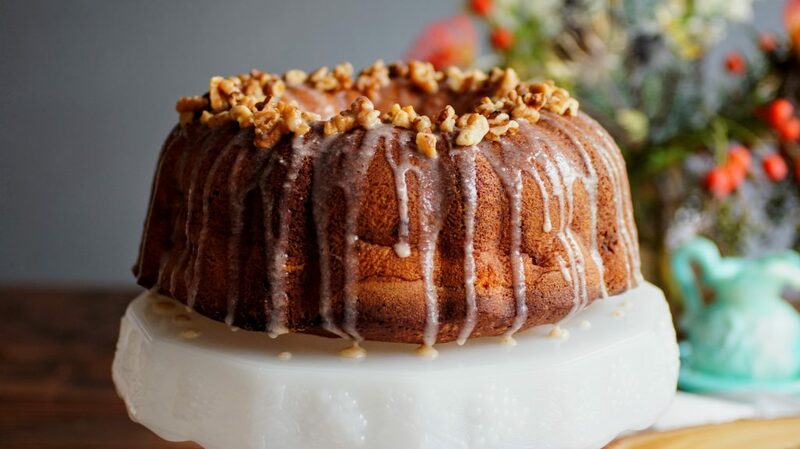 Once cake has cooled, drizzle brown butter glaze and top with walnuts while glaze is wet. Melt the butter on medium heat. Continue melting until brown bits begin to form. Be sure to scrape and swirl the pan as the butter melts. Remove when the smell is aromatic and butter has browned. Whisk in the remaining ingredients until a smooth glaze forms. *Feel free to add in walnuts to the center of your cake if you'd like. 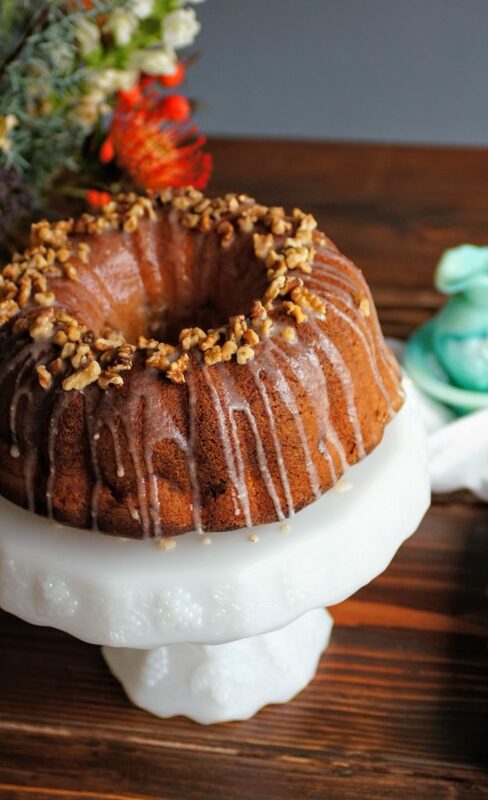 *The glaze and additional nuts are definitely optional, the cake on its own is amazing and can stand up to any dessert tray.